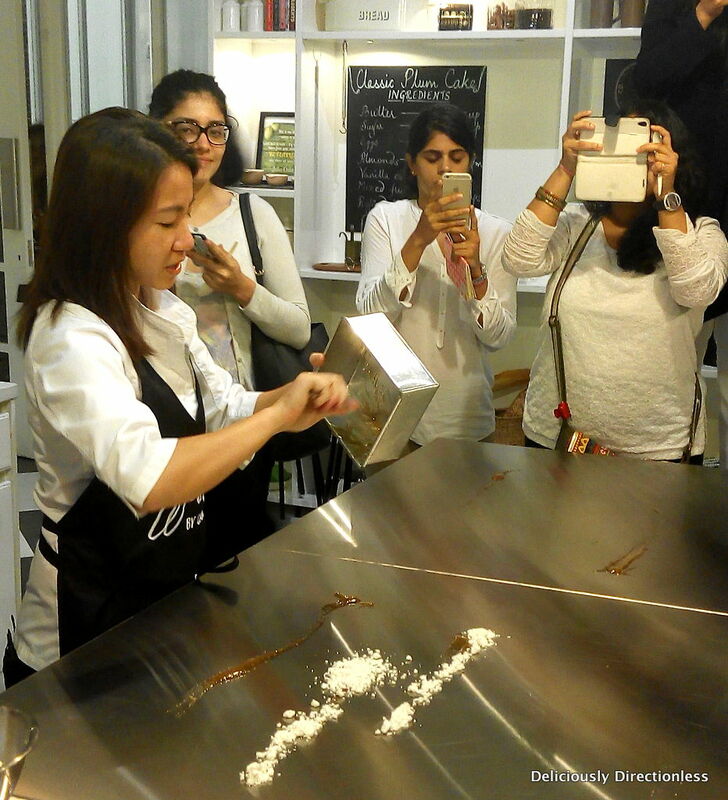 One of the best pastry chefs in the world, a spanking new baking studio in the city and the opportunity to not just watch an artist in action, but also a chance to eat one of her edible art creations – that’s what I was up to last week. 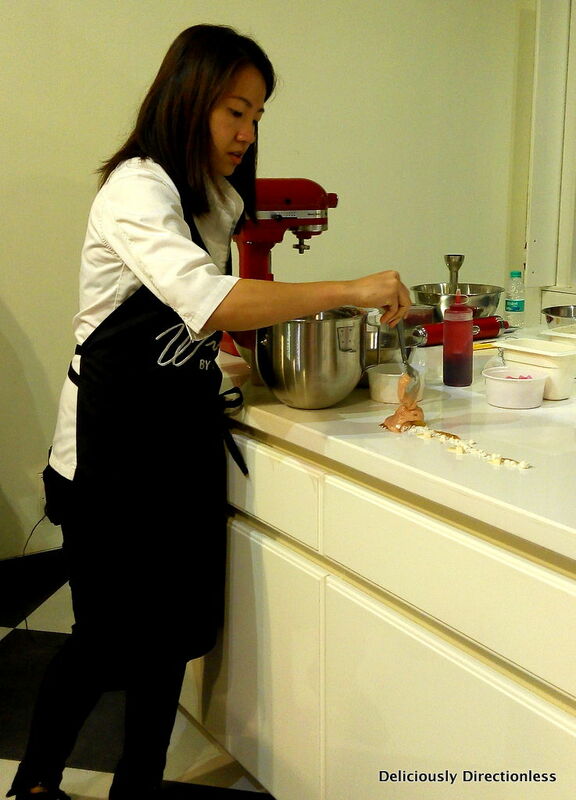 Janice Wong has been named Asia’s Best Pastry Chef for two years in a row (2013 & 2014) by San Pellegrino sponsored “Asia’s 50 Best Restaurants” Awards. 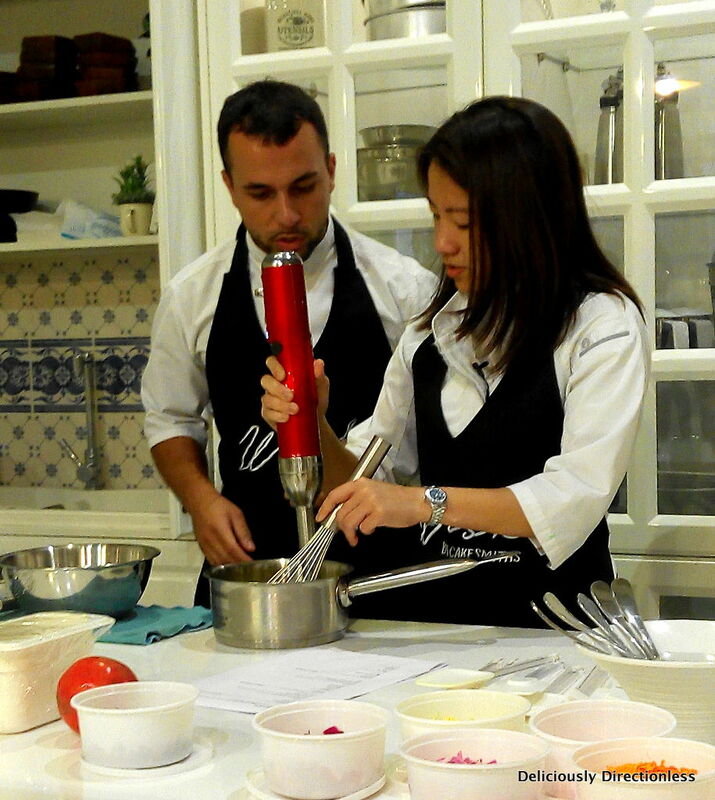 Wong owns one of Singapore’s best pastry shops, the 2am:dessertbar. 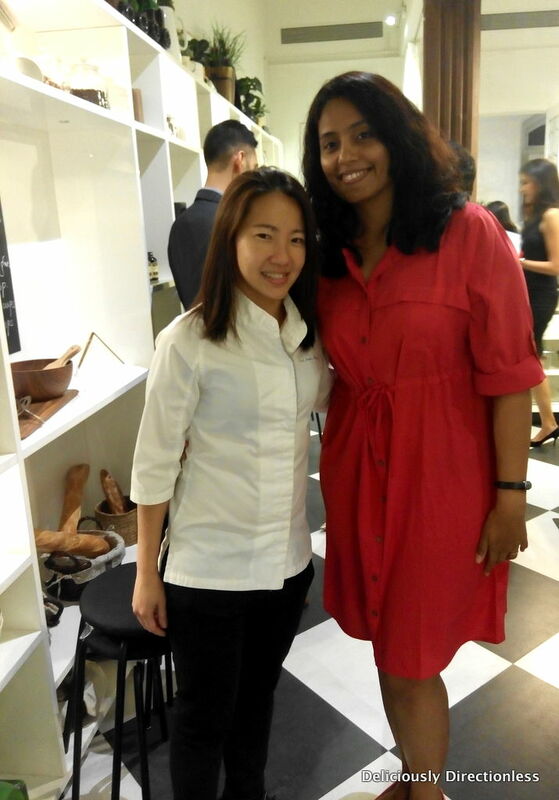 She was specially brought down to Mumbai to inaugurate the gorgeous baking studio, Wisk. 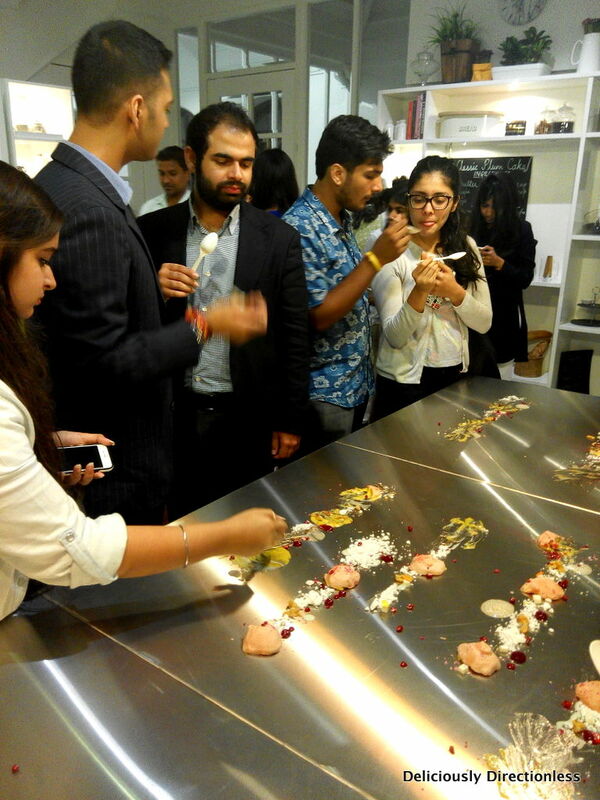 I was invited for the media launch last week and Thursday evening found me in Kala Ghoda in South Mumbai, excited about checking out the newest studio kitchen in town, and getting a first-hand look at edible art in the making. Wisk is located on the second floor of Jatia Chambers, a pretty white building in the lane going down from Rhythm House. I walked up the wide, old-fashioned staircase of the building, and into a kitchen wonderland straight out of one of those fancy TV cooking shows! 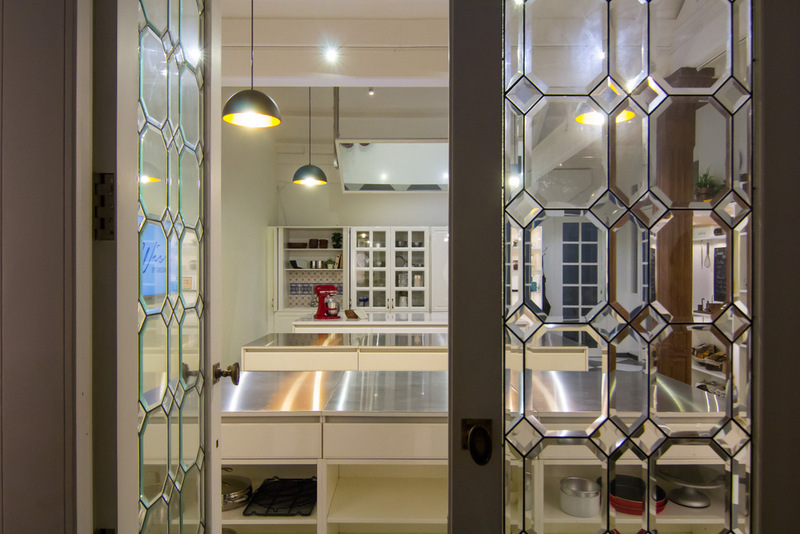 The studio has cute touches here & there – pretty crockery, inspiring cookbooks and lust-worthy baking paraphernalia. 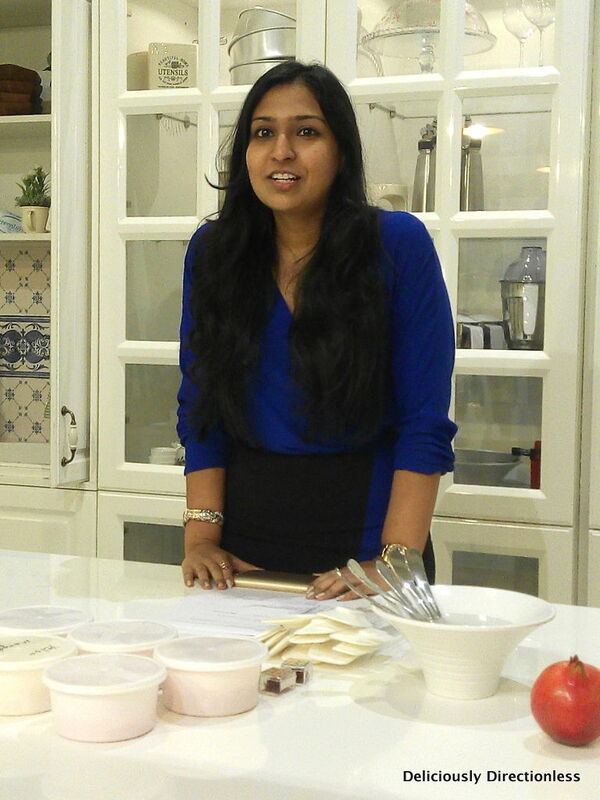 Wisk is the brainchild of Vrinda Jatia, an entrepreneur who launched Cakesmiths in 2014 – an online platform where you can buy high-end baking supplies. Encouraged by the response to her venture, she then decided to open this beautifully-appointed baking studio, which simulates the experience of a professional bakery. 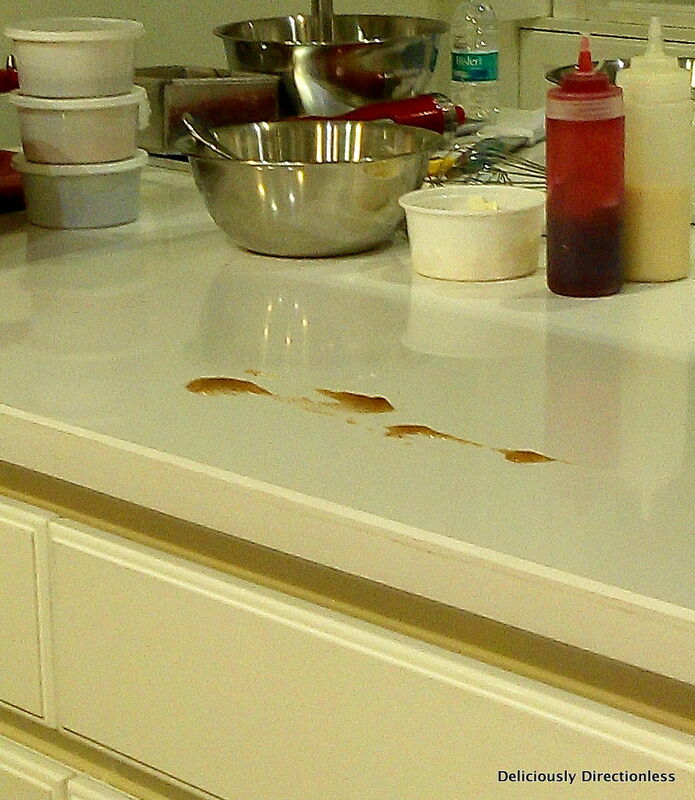 The state-of-the-art baking studio is aimed both at professional bakers and serious home bakers. 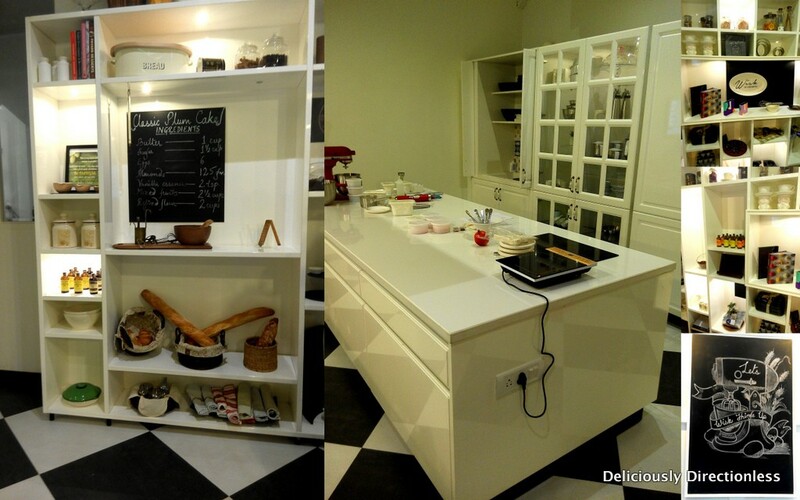 I loved the clean, slightly minimalist decor of the studio, fully stocked with some of the best baking equipment. Janice Wong was going to demonstrate a dessert that showcased multiple techniques and had several elements. She called it Guava Mango, and it was a combination of a guava cloud, mango cardamom sorbet, plum pate de fruit, condensed milk two ways, thyme oil snow and hibiscus sauce, not to mention the various garnishes (whew!). Whisks, stand mixers and of course, liquid nitrogen made an appearance as the elements started coming together. 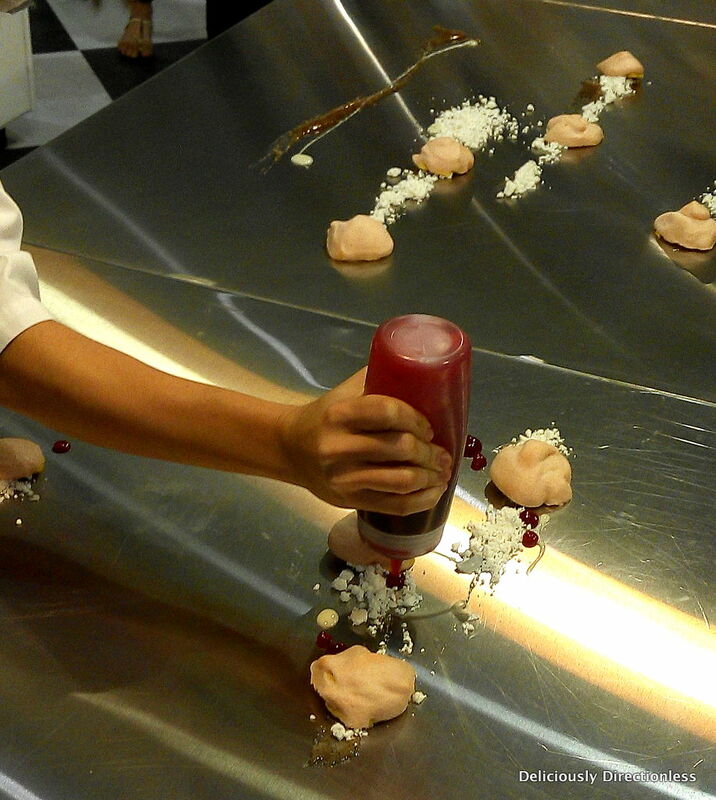 Instead of plating it on one of those (ugly) plastic plates, Wong began putting the elements together on the gleaming counter top of the baking studio. 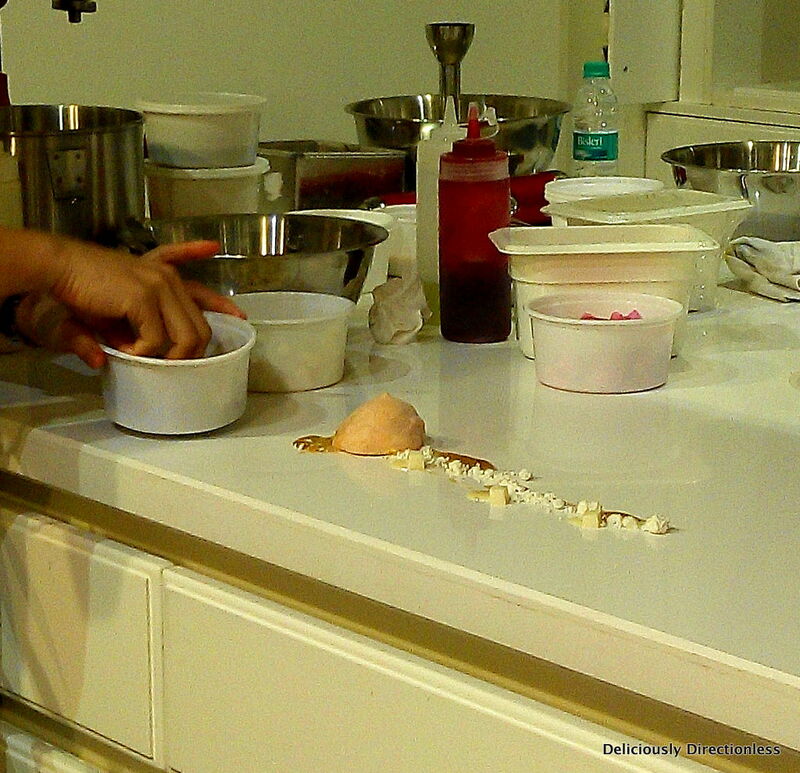 It was a treat watching her assemble the dessert with the practised hand of an acclaimed pastry chef. 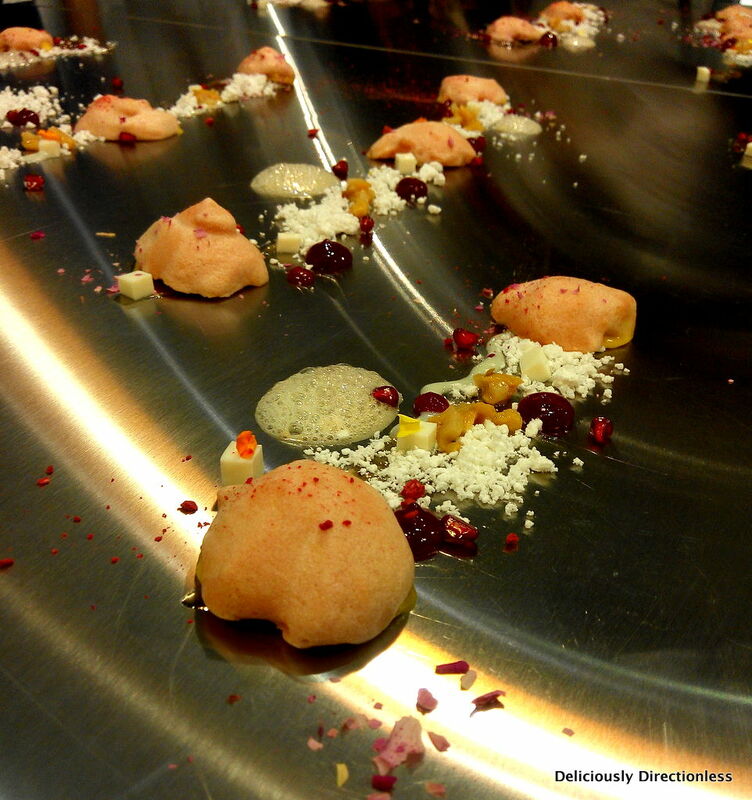 A smear of jelly, a dollop of mango sorbet, guava cloud, ‘cubes’ of condensed milk, thyme oil snow, pomegranate seeds, crushed freeze-dried raspberries, and the Indian touch with frozen rose petals – it was not just a dessert, it was a work of art! 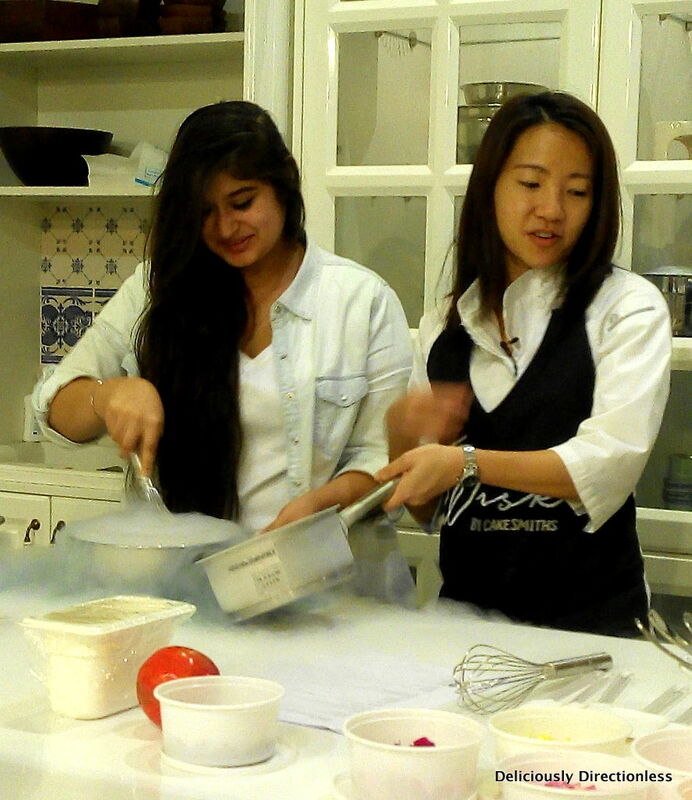 To add to the Indian element, Wong also decided to make an impromptu chilli foam, for which she used the vada pav chutney from her evening snack! The spicy, garlicky chutney complemented the sweet guava-mango sorbet perfectly, and it was such a clever element to add. Wong ‘plated’ up our tasting portions on one of the demo countertops, and we all stood around with spoons, digging into one of the most beautiful desserts I have ever seen! 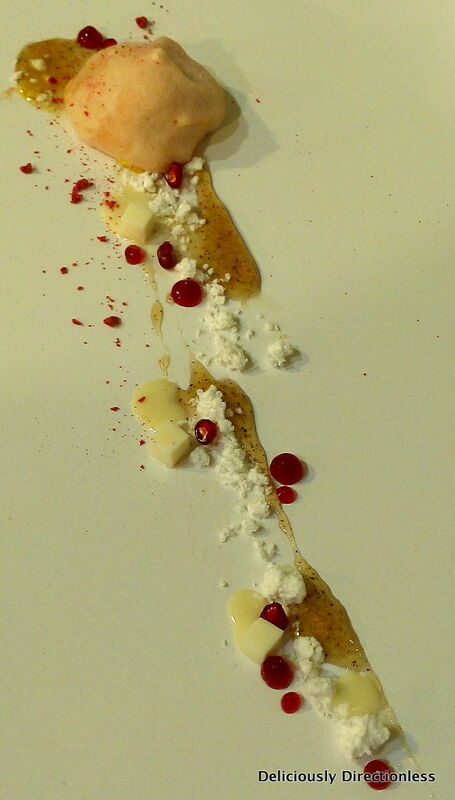 This is what the final dessert looked like. The pink guava cloud covers the mango cardamom sorbet. Pretty, eh?! Find out all about Wisk by Cakesmiths. Upcoming classes are available here.